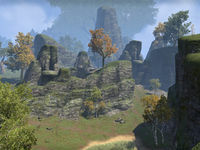 Shrieking Scar is an escarpment in southwestern Glenumbra, north of Daggerfall. Lord Alain Diel of Daggerfall has set up a camp in the area and is investigating a number of recent harpy attacks. Shrieking Scar Objective: Discover the cause of the harpy frenzy.